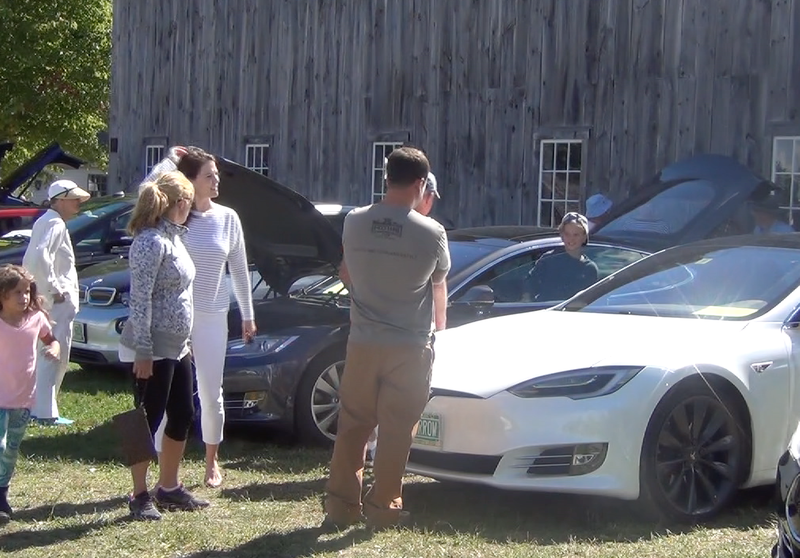 This past weekend, over 200 people gathered on the grounds of the New London Historical Society to attend the the New London Electric Car Expo. Area residents had the chance to look at electric cars from the past like the 1923 Red Bug Electric to the all new Tesla electric cars from today. Electric cars and hybrids from other manufacturers included BMW, Chevy, Nissan, and BYD. Also at the expo were electric assist bicycles the people could try out for themselves. Owners and enthusiasts of all electric cars and hybrids brought their own vehicles to the show and talked about their experiences in driving electric cars in all seasons, finding charging stations, maintenance, and many other pros and cons of driving an electric vehicle. Short lectures were also given on the benefits of an electric car and the how to go about buying and installing solar panels. The free event was one of more than one hundred similar events held around the country during the fifth annual National Drive Electric Week. The event was organized by the New London Energy Committee and the Andover Energy Group.